While in San José, we'll be staying for 2 nights (one night at the beginning of the tour and another night at the end) at the San José Marriott. 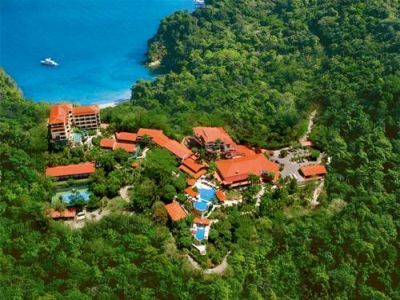 Located close to the airport, the colonial hacienda style hotel sits on a former coffee plantation and offers modern amenities in a laid-back environment. 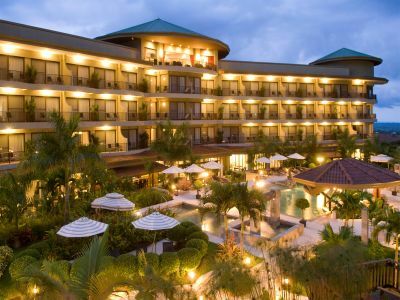 Voted by Condé Nast as one of the best hotels in Central America, the San Jose Marriott features the state of the art fitness center, two swimming pools, tennis courts, lush gardens, a concierge lounge, a gift shop, and a full-service, coffee inspired Kuö Spa. Dining options include the Celebrity Chef Michael Mina’s Arcadia Steakhouse, Tanq Bar and La Castilla, where sushi is prepared right in front of you and 24-hour room service. The 229 sophisticated rooms boast plush bedding, flat-screen TVs with international cable channels and WiFi. Bathrooms feature cozy robes and upscale bath products. This hotel has a smoke-free policy. While in La Fortuna, we'll be staying for 4 nights at the Royal Corin Resort and Spa. Located in a peaceful setting in La Fortuna, the hotel offers amazing views of Arenal National Park and volcano, and features outdoor thermal springs with warm and cold water swimming pools, garden thermal pools, waterfalls, thermal steam sauna, a thermal river, a pool terrace, a wet bar and a luxurious Loto Spa. Guests can enjoy international cuisine at the a la carte Emperador Restaurant and the 5th floor Lava Bar. Each of the 54 rooms is decorated in light tones and comes with linen bedding, bathroom showers with hydro massage jets, mini-bar, in-room safe, hair dryer, a private furnished balcony, flat-screen TV, free Wi-Fi, alarm clock, complimentary coffee service and coffee maker, air conditioning, and is decorated with local artwork. 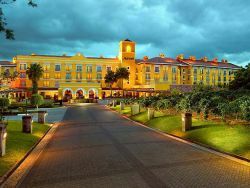 While in Manauel Antonio, we'll be staying for 3 nights at the Parador Resort and Spa. Located high above the sweeping Pacific coastline of Manuel Antonio’s famous beaches, Parador Resort is surrounded by 12 acres of wildlife-rich tropical rainforest. This eco-luxury resort is 4 minutes walk from the beach, and features 3 pools overlooking the Pacific Ocean, a world-class spa including a hot tub and plunge pool, tennis courts, stae-of-the-art fitness center, and 4 restaurants serving international and local fare made from the fresh ingredients. Other amenities include a library and book exchange, ice machines, room service, and laundry services. Each of the 119 bright, air-conditioned rooms has a private balcony with jungle or garden views, luxurious queen size beds with high-quality linens, a cable TV, free Wi-Fi, a mini bar, coffee maker, and spacious bathrooms outfitted with hair dryers, robes and complimentary toiletries.